The Friday Night Jamboree leaves an indelible impression on all who experience it. Tonight I observed something that has escaped my attention until now. The magical quality of the Friday Night Jamboree is a product of the street that it is staged on. Some people will tell you that it is the pervasive sound of Bluegrass and Old Time music being played on the street by groups of musicians who play for the love of it. 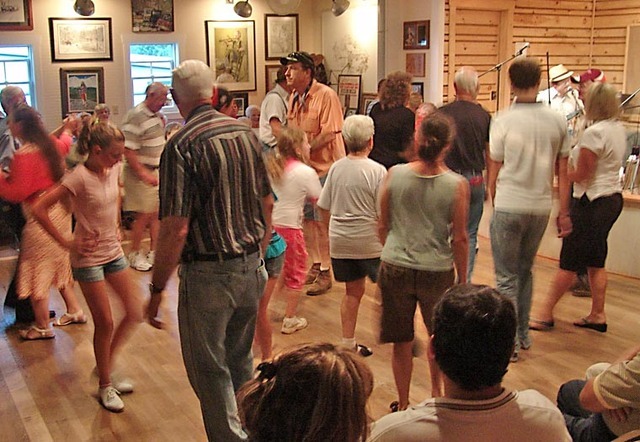 Some will assure you that it is the ambiance of the Floyd Country Store and the crowded dance floor full of cloggers beating out a thunderous accompaniment to a riotous dance tune that has been a popular favorite for many years. Others will nod quietly and smile, content in their knowledge that it is the music in the hearts of the men and women who carry their instruments from their cars to the groups that welcome them to join in and play. 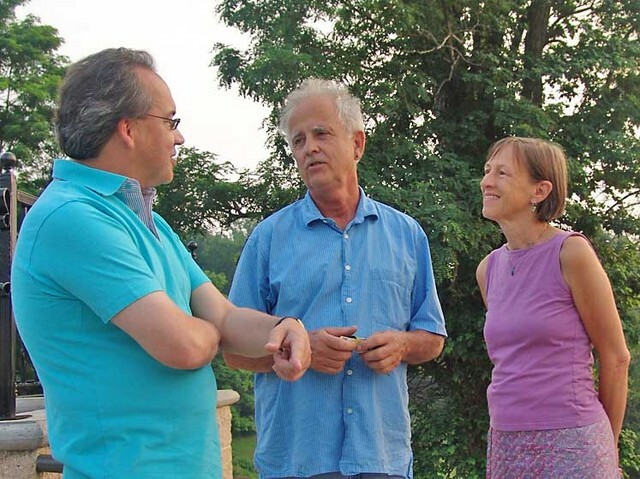 Strangers from far places marvel at the easy grace with which musicians join with one another and celebrate life with music and song on the streets of this tiny town in southwest Virginia. Spectators cluster around performers in rapt attention and reward each tune with generous applause. Cameras click and spectators murmur as music touches the heart again and again. Some spectators are so stirred by the melodies playing that they burst into impromptu dance performances. Children dance along the sidewalks to the delight of all concerned. Their enthusiasm for the music transforms their faces. Those who sit in the alcoves along Locust Street and watch the show will be tapping their feet while chatting with neighbors and passers-by. These are components of the magic, but the real magic of this Friday Night Jamboree is that it all occurs in a space that encourages and facilitates easy communication. The magic that I see occurring every Friday night in front of the Floyd Country Store in Floyd, Virginia, is that all of the things I describe happen in a bounded area that is large enough to allow free movement and free discussion without being overwhelmed by sound volume and is small enough that you can walk from one end to the other in a matter of minutes. By accident or by design, the Friday Night Jamboree is small enough for a feeling of intimacy and distributed enough so that you can carry on a conversation with everyone you meet without annoying others or having to shout over the music. 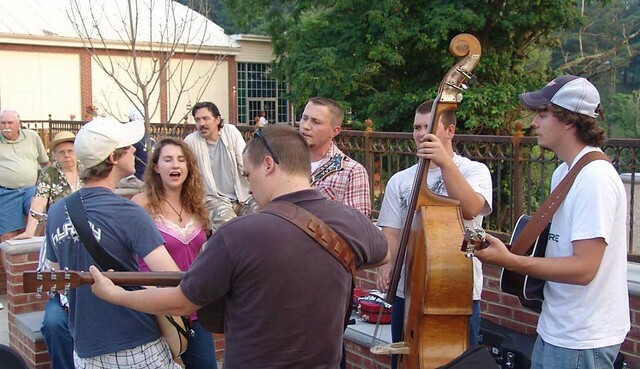 It has all of the elements of a successful party or mixer, lots of great music that doesn’t overwhelm, a place to dance with a lively crowd on the dance floor, multiple musical groups offering Gospel, Bluegrass, Old Time Music, Blues, and Jazz, and places for uninterrupted talk with friends. My take on it is that a number of Floyd citizens and County officials have contributed to this magic by creating a unique environment on Locust Street which has all of the elements needed for a successful party for up to 500 people. Woody and Jackie Crenshaw have created enhanced the Friday Night Jamboree by their expansion of the Floyd Country Store which is the glowing center of the Friday Night celebration. Local and regional musicians gather weekly to jam in freeform musical clusters up and down Locust Street. The new broad sidewalk with spacious alcoves for musical performances provides a structure that encourages performances by all who desire to play. The Cafe del Sol, the El Charro and the Floyd Country Store have delicious food and snacks for the floods of visitors roaming Locust Street on Friday nights, so there is no reason to wander further unless you want to sample the cuisine at Oddfellas Cantina or the country goodness of the Blue Ridge Restaurant or the Pine Tavern. If you have ever attended a party that was held in a space that was too small or way too large, you know how the setting can make or break an event. The Friday Night Jamboree occurs in a space that is just the right size for the current number of attendees. As attendance grows in the future, care must be taken so that the musical activity can spread out gracefully and that people can still wander freely about and converse during the evening. Easy communication amongst the visitors will keep the magic of the Jamboree alive. This entry was posted in Seen around Floyd and tagged Blue Ridge Restaurant, Cafe del Sol, El Charro, Floyd Country Store, Floyd Virginia, Friday Night Jamboree, Locust Street Floyd, magic, magic of easy communication, Oddfellas Cantina, Pine Tavern. Bookmark the permalink.